By checking this page for the newest Super Hero Stuff coupon codes and SuperheroStuff promo code discounts, shoppers can save on superhero t-shirts, hoodies, hats, action figures, and more. Check here for SuperHeroStuff.com coupons and promotion codes for deals like instant discounts, free shipping, or cheap sale prices. When people hear the word “geek,” they often think technology and computers, but another more creative theme comes to mind as well: comic books. If you’re a comic book lover, don’t miss out on the largest superhero store on the web. Surf over to www.superherostuff.com to satisfy your longing for the unique and heroic. Find an interesting assortment of merchandise related to your favorite super hero. They carry products featuring Superman, Batman, Green Lantern, Thor, Captain America, Spiderman, Flash, and the Fantastic Four, to name but a few. More interested in the ladies? The store stocks Supergirl, Batgirl, and Wonder Woman products as well. Get superhero T-shirts for men or women in a range of sizes. Whether you’re looking for a shirt that features the X-men, Iron Man, Punisher, Wolverine, the Hulk, or the Silver Surfer, you’ll find it at Superherostuff.com. If science-fiction is more up your alley than traditional comic book superheroes, you can buy Star Trek or Star Wars T-shirts. They also retail shirts featuring Dr. Who, the X-Files, Star Gate, and Battlestar Galactica. You can even buy video game T-shirts (such as World of Warcraft) or horror-themed tees. It’s popular to sport your favorite comic book characters on a tee, but that’s not the only clothing available on the site. You can browse a super-hero-saturated collection of belts and buckles, footwear, hats, caps, gloves, hoodies, sweatshirts, pajamas, and underwear. The store carries superhero and sci-fi action figures, bags, backpacks, buttons, pins, and bobbleheads. Outfit your iPhone or other smart phone with a superhero cell phone cover. Browse a massive inventory of comic books and graphic novels. Find jewelry, key chains, key rings, mugs, pints, shots, and magnets. Get classic superhero lunch boxes and tins, such as the Star Wars Yoda Strikes square lunchbox or the Spiderman Web Spin Domed Lunchbox. Decorate your office, cubicle, or other room with superhero posters, prints, and signs. Spruce up your computer desk with a superhero statue, bust, or bank. 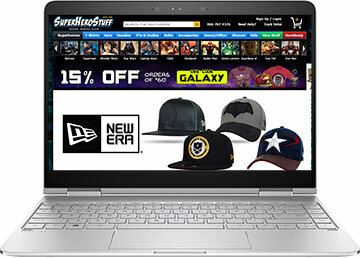 From Batman mouse pads and Wolverine retro stereo headphones to the Star Trek New Enterprise USB keyboard and the Thor wireless mouse, you’ll be able to satisfy your every superhero product longing at the Super Hero Stuff online store.